Bizet’s Carmen has everything you want from an opera: high drama, passionate characters, a love story. And what’s more it’s absolutely packed with great melodies – even if you don’t know the opera, you’ll definitely know the tunes. Bizet wrote a fair few great works – the Te Deum for a start – but in Carmen he really went up a gear in terms of writing entrancing melodies. The opera opens as Carmen and her fellow cigarette-factory workers stream out at the end of a day. Local young men surround then and start to flirt – but Carmen explains her heart can’t be tied down with the unforgettable habanera, which begins with the words ‘Love is a rebellious bird that none can tame’. When she is arrested for attacking another woman with a knife, she seduces Don José to escape. 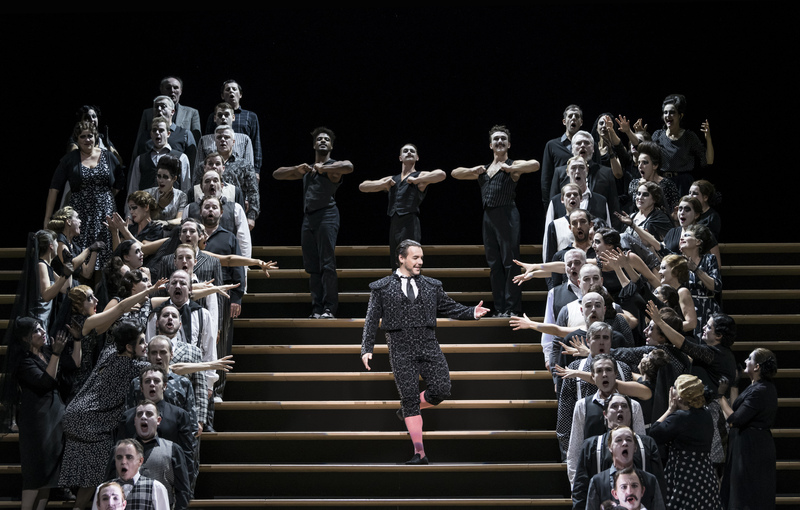 The pair become lovers and Don José ends up running away from the army to be with Carmen. But two months later, Carmen has tired of Don José and has turned her attention to the bullfighter Escamillo. In a fit of jealousy, Don José follows Carmen to the amphitheatre where the bullfighters are about to perform – and stabs her. She dies in the arms of Escamillo. Carmen, as created by Bizet, has become the stereotypical Spanish woman of the 19th century in the popular imagination. She’s hedonistic, impetuous, hot-tempered and cold-hearted. She’s lovestruck and a femme fatale at the same time. It’s ironic, then, that this quintessential Spanish woman… was created by a Frenchman. Not only that, Bizet’s opera was actually based on a story by another Frenchman – Prosper Mérimée. But wherever she came from, Carmen has become one of history’s most iconic opera characters. She may die at the end of the opera, but she lives on way beyond her few hours on stage to become part of our cultural landscape. There’s one character we haven’t mentioned yet: Micaëla. She’s a sweet village girl who’s in love with Don José herself. She’s quieter and altogether less Carmen than Carmen. So Don José, of course, barely notices her. Even when she tries to get his life back on track by going to fetch him home from the smugglers’ camp he’s living in with Carmen. The composer himself had a sense that he’d written something greater than all his other works. He wrote in a letter to a friend that he had “absolute certainty of having found my path”. That makes it even sadder, therefore, that the opera wasn’t a success when it was first performed in 1875. One critic noted that the audience in Paris was “shocked by the drastic realism of the action”. Bizet died just three months later, at the age of just 36. He’d never know that his scandalous opera about an irrepressible young Spanish woman would go on to become one of the best known and best loved pieces of music of all time. Carmen is on at the Royal Opera House until 16 March and live in cinemas on Tuesday 6 March. Find out more here.